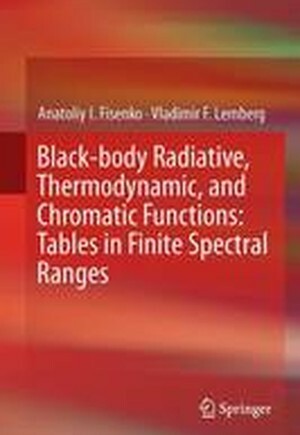 This book provides detailed calculated values for the thermal radiative and thermodynamic functions of black-body radiation in finite spectral ranges. The results are presented in tabular form. The areas of thermal power generation, infrared medical diagnostics, solar power and nuclear generation, and astrophysics are included. A range of the thermal radiative and thermodynamic functions are calculated by the authors in the finite frequency/wavenumber/wavelength intervals at different temperatures. This book also contains the tables of the chromaticity coordinates and RGB parameters calculated for different color spaces (Rec.709 (HDTV), sRGB, Adobe RGB). A number of the optimization problems is formulated and solved for various thermal black-body radiative and thermodynamic functions in a finite range of frequencies. 1 Black-Body Radiative Functions in a Given Spectral Range.- 2 Thermodynamics of Black-Body Radiation in a Given Spectral Range.- 3 Examples of the Use of the Tables 1-3 for Practical Applications.- 4 Chromaticity Properties of Black-Body Radiation for Different Color Spaces.- 5 Optimization Problems for the Devices Using the Black-Body radiation.- 6 Tables of Black-Body Radiative, Thermodynamic, and Chromatic Functions.